Lately, especially popular punchers Interskol. They are reliable in operation, easy to repair. They are easy to get spare parts. Hammers Interskol have a wide range of. Tools conditionally divided into two segments: hammers, completed with a cartridge-type SDS-plus, and drills with chuck type SDS-max. Repair Interskol punch can be made both in the service centers, and independently. To perform the repair hammers Interskol own hands, we must have the skills and knowledge of the locksmith in electrical engineering in the amount of high school. And always remember to respect the safety rules. numeral 450 indicates punch wattage. Ruler Interskol hammers with SDS-plus patrons represented 13th models: P-18 / 450ЭR, P-20 / 550ЭR, P-22 / 620ER, P-24 / 700ER, P-24/2-700ER, P-26 / 750ЭV, P-26 / 800ЭR, P-26/2 800ЭR, P-28 / 800ЭV, P-30 / 900ЭR, P-30/2 900ЭR, P32 / 1000Э, P-32 / 1000ЭV-2. Interskol Hammers with SDS-max ammo presented models: Interskol P-35/1100, P-35 / 1100ЭV-2, P-40 / 110ЭV-2, P-45 / 1100Э, P-50 / 1200Э. In the market there are other models of hammers Interskol: Interskol P-600 and ER Interskol P-710 ER. These models are manufactured in the early development Interskol manufactured. In a domestic environment, people are the most common models are the hammers Interskol paragraph 26 / 800ER, P30 / 900ER, P710 / ER. The principle of operation is the same for all hammers. The torque from the rotor is transmitted to the barrel shaft and a working tool mounted thereon. simultaneously, with the help of the rocker bearing, Popularly known as "drunk bearing", the torque is converted into a reciprocating motion, transmitting the impact impulse to the working tool. All perforators Interskol assembled on one common chart and consist of the same units. Block power circuits and control. Repair hammers Interskol should begin with the study of the instrument scheme, training tools and the workplace. These blocks have these models have their own design features. For ease of consideration, divide into groups represented drills. The first group will include perforators Interskol P-18, P-22, P-24, P-26, P-30. In the second group, consider dismantling hammers Interskol P-600 and P710. We begin with the differences in the node structure mounting the keyless chuck. The principle of dismantling the keyless chuck in all rotary hammers almost the same. The rotary hammers Interskol used keyless chuck type SDS-plus. To work with the hammer Interskol necessary to use a tool with SDS-plus shank. 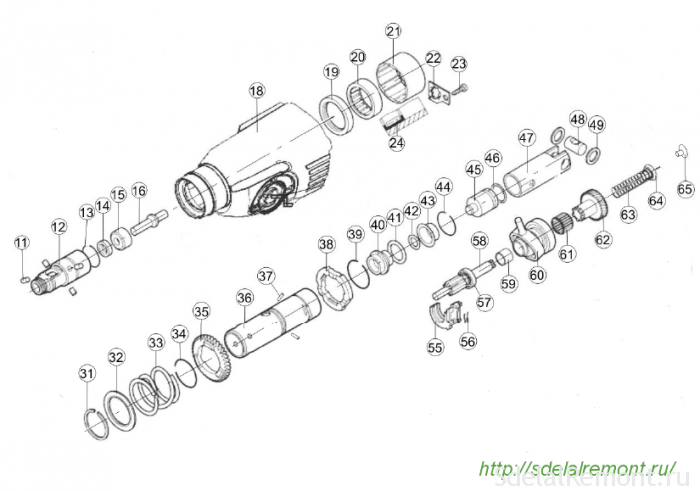 Disassembly keyless chuck consider the example Interskol perforator P-26 / 800ER. Setting a punch to the back of the handle, it is necessary to remove the protective sleeve Item 1, pos.2 remove a washer and locking ring to get pos.3. Then removed the washer and retaining ring pos.4 pos.5. The next step removed the pressing sleeve pos.6. To release the locking ball pos.8 press the special washer pos.9. Remove the ball, remove the conical spring item 10. The design of the keyless chuck Interskol perforator P-30 / 900ER comprises a minimal number of parts. But the order of disassembly is the same. Keyless chuck in rotary hammers Interskol P-600ER and 710ER P-almost identical and disassembled in an identical sequence. spiral spring is extracted pos.5. 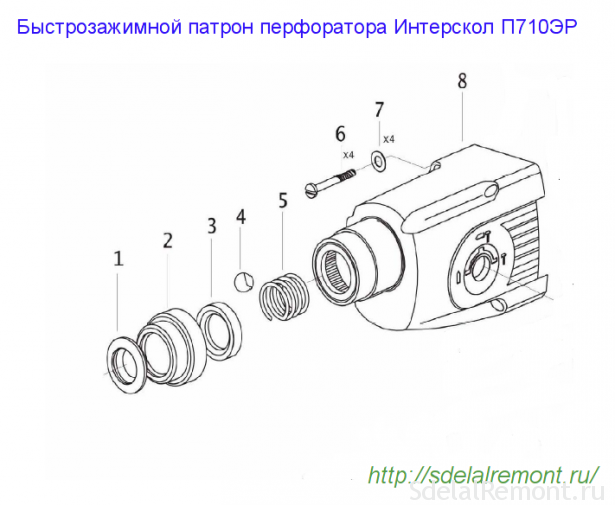 All rotary hammers Interskol to remove the gear case, you must first remove the switch modes. Tilting to one side punch, turn the handle pos.28 modes counterclockwise until it stops while pressing the button at 26. Remove the handle of the gun body. Never switch knob modes running, punch. Main differences number contained in the hammer structure. The firing mechanism in rotary hammers Interskol works on the same principle. Differences in the design features. position 12 the tool receiver disassembled after their removal from that parts of the keyless chuck. In the first stage carefully removed four rollers pos.11. Then the receiver is removed from the body poz.18, wherein the inserted needle bearing poz.20. The needle bearing mounted shaft poz.36. Remove the tool receiver from the barrel. From the tool receiver have to remove prommassu pos.16, sleeve poz.15, pos.14 cuff and a rubber sealing ring pos.13. Poz.36 trunk is removed from the inner casing after poz.18, as the gear housing is separated from the stator housing. 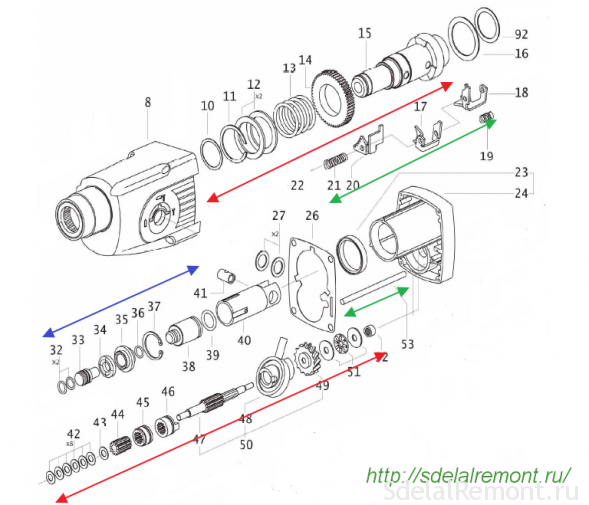 To do this, from the gearbox housing is necessary to unscrew four screws poz.30. Then, unscrew the three screws on the handle poz.85 poz.86. After removing the handle, rotate the housing brush holder poz.81. until, when it can be pulled out of the housing. Now the gear housing and the stator housing are easily separated with a screwdriver, where to hook one of them in the place of docking. The barrel can be easily removed from promschita poz.53(inner case). On the outer diameter of the trunk are put: spur gear poz.35, spring poz.33, poz.32 washer and circlip poz.31. In the cavity of the barrel body is catcher poz.40, paint 45. Disassembly poz.40 catcher is to separate it from the suspension poz.41, catcher pin poz.42, the lid catcher poz.43 and locking ring poz.44. The piston is inserted into the striker poz.47 poz.45, to be learned. Since the striker poz.45 removed sealing ring poz.46. poz.47 must be separated from the piston finger poz.48 ears and remove the two rings poz.49. To disassemble the intermediate shaft poz.57, it is necessary to pull it out of the inner housing. With shaft poz.58 remove lead switch poz.55, spring poz.56. C on the other side: Remove the sleeve bearing poz.65, spring seat poz.64, spring poz.63, Gear wheels combined poz.62. 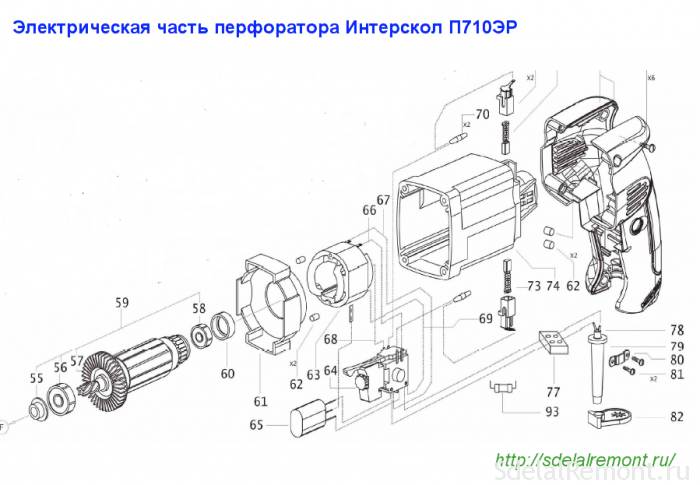 The design of the impact mechanism and procedure for disassembling the gun at Interskol 710ER is somewhat different from other models of hammers. The major differences in the structure of the intermediate shaft, barrel and the hammer mode selector. Puncher Interskol 710ER is a machine rotary-percussion action. It consists of the drive and actuator. As used electric commutator motor. The actuator is a combination of the hammer air cushion type and a rotational mechanism. 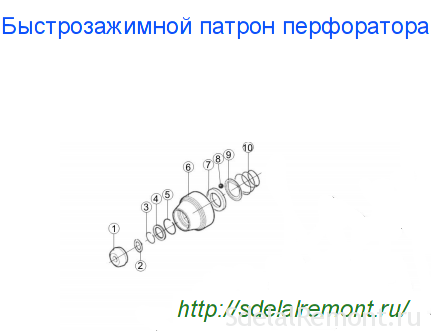 The reciprocating movement is transmitted due to the rolling bearing. In the diagram, the order of disassembly poz.15 trunk (marked by a red arrow), part of the strikers and strikers (is indicated by the blue arrow). Green arrows indicate the details of the mode switch. The intermediate shaft includes a shaft poz.47 and parts mounted thereon. 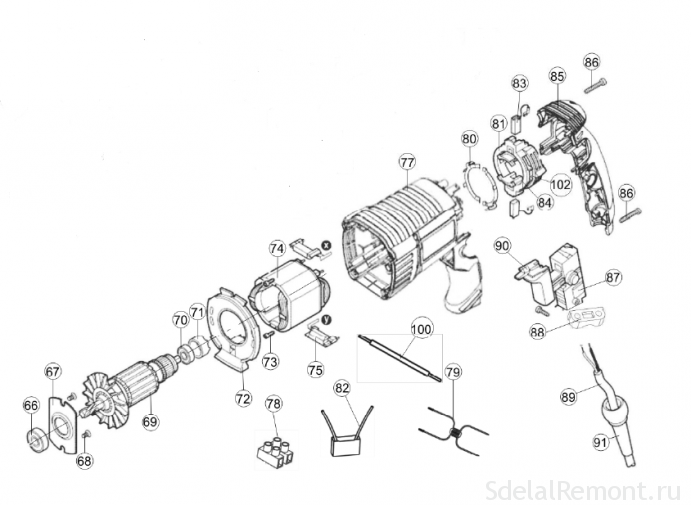 easily disassembled, according to the attached schema, It does not require special knowledge. Control circuit with carbon brushes. 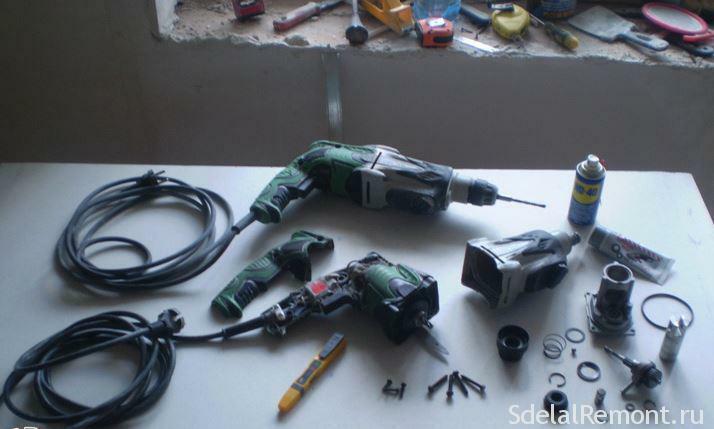 An order of dismantling the electrical part of all models hammers Interskol almost the same. In the previous stages, we have divided the body into two: the gearbox housing and the stator housing. To disassemble the stator poz.74, necessary to pull out the protective housing poz.77 diaphragm poz.72, covering the stator from dirt, dust. Unscrew the two screws and remove the stator poz.73 poz.74. To facilitate the process of pulling out enough to knock on the end cap of the stator with a wooden hammer or bar. The stator can be removed from the terminal block poz.75. This is done, to check the quality of the contacts from the stator to the brush holder. 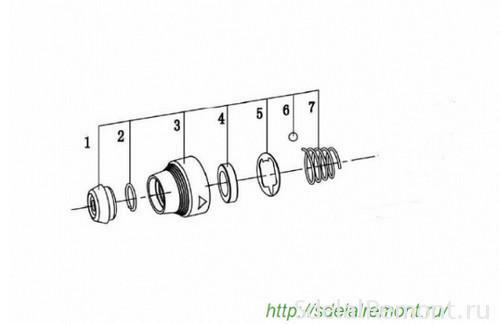 Rotor versed in the case, when it is necessary to replace the manifold, bearings, peremotat winding. 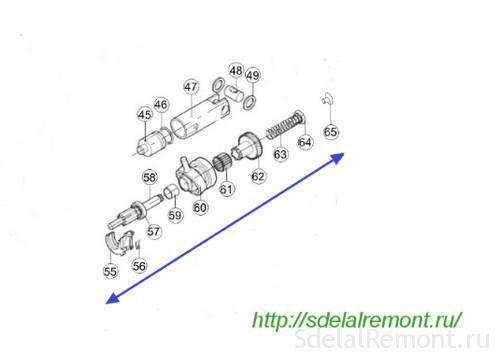 Separate the rotor from the hammer assembly can be, Loosen the two screws and removing the shield poz.68 poz.67. With the rotor poz.69 necessary to remove bearings poz.66, 70, sleeve damping poz.71. Bearings are easily removed with the help of a stripper. The basis of the control of the puncher Interskol poz.87 switch and reverse lock poz.90. With the help of the combined punch button, you can set the speed of the motor frequency. To get the brush poz.83, it is necessary to remove the brush holder poz.81. Removed by turning it counterclockwise by 90º. freeing the brush holder, carbon brushes are easy to get. It used a different type of switch. Everything! Perforator Interskol harvested. 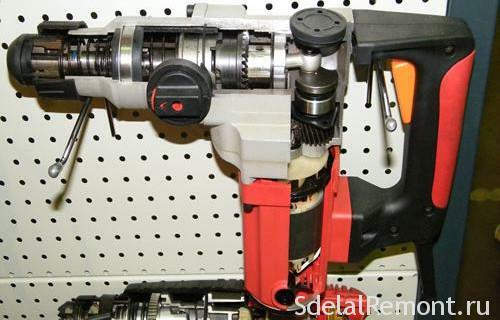 Read instructions to repair and how to assemble and lubricate punch.